The aim of this report is to discuss the role of management in organisations and assess the relative importance of information as a system. 1. TERMS OF REFERENCE 1 2. INTRODUCTION 1 3. ROLE OF MANAGEMENT 2 4. IMPORTANCE OF INFORMATION 3 5. FINANCE 4 6. RAW MATERIALS 5 8. PLANT AND EQUIPMENT 7 9. CONCLUSION 8 REFERENCES 9 1. 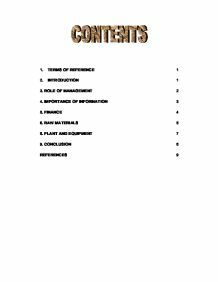 TERMS OF REFERENCE The aim of this report is to discuss the role of management in organisations and assess the relative importance of information as a system. 2. INTRODUCTION Organisations employ various resources such as finance, raw materials, people, plant and equipment in order to achieve their objectives and this will be discussed in more detail. An organisation is a group of individuals who work together in order to achieve objectives and to provide satisfaction for their members. (Mullins, 1993). There are a various different types of organisations set up to meet individuals needs. (Mullins, 1993). There are three common factors in every organisation which are people, objectives and structure. (Internet site 1). For an organisation to be effective it depends on the quality of its people, objectives and structure and resources available. There are two categories of resources: > Non-human - physical assets, materials and facilities and > Human - members abilities and influence, and their management. (Mullins, 1993). 3. ROLE OF MANAGEMENT In organisations there are a number of various skills required in the role of management such as: > Communication - learn to listen and be observant > At least ten years working in a field similar to those being managed > Leadership - a true leader, is willing to do any task which is necessary to ...read more. (Internet site 5). Most organisations main aim is to earn a profit, to achieve this managers require financial control and they mite carefully analyze quarterly income statement for excessive expenses. . They might also perform several financial ratio tests to ensure that sufficient cash is available to pay on going expenses. (Robbins, 2005) Organisations require a finance department as they deal with all the accounts of the organisation and see how much income the organisation is generating. The finance department deals with all the financial affairs of an organisation and their main activities are: > Financial planning - predict future financial requirements and the amount of income that will be generated for decision making, strategic planning and plans for raising the finance required to support the business strategy. (Armstrong, 1999). > Financial accounting - recording all financial transactions, preparing balance sheets, profit & loss, value added statements, handling depreciation and inflation accounting. (Armstrong 1999). 6. 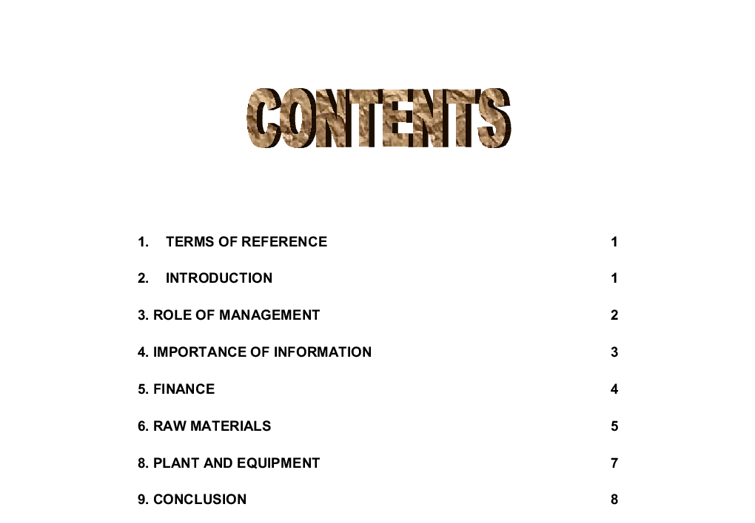 RAW MATERIALS Most organisations have a control system which is inventory control. (Bartol, 1998). Inventory is a stock of materials that are used to facilitate production or to satisfy customer demand. (Bartol, 1998). There are three major types of inventory: > Raw materials > Work in process > Finished goods Raw materials inventory - is the stock of parts, ingredients and other inputs to a production or service process, for example, the raw materials inventory at Mc Donald's would be the hamburgers, cheese slices and buns. ...read more. > Decide where plant should be located and the type of technology to use. (Appleby, 1994) The size of production should be considered wisely, bearing in mind the uncertainty of long term forecasts. If maximum expected demand is met, this can lead to surplus capacity, which may or may not be able to be utilised, as under utilised plant is not economical. (Appleby, 1994). Factors critical to the decision of the location should be carefully considered. Conventional location reasons are, raw materials, skilled labour availability, financial incentives and transport. (Appleby, 1994). Organisations must ensure that they pay a great deal of attention to the maintenance of the plant and equipment as failure to do so may lead to plant failure and consequent delays in production. (Appleby, 1994). Organisations should make sure the maintenance of buildings, plant and machinery to ensure efficient working order and make sure regular inspection is done and attention is paid to any breakdowns and that tools and equipment are in good working order. (Appleby, 1994). 9. CONCLUSION As it has been discussed there are many important factors in an organisation in order for them to achieve their objectives. They employ various resources to become successful organisations. The role of management has been analysed and what the main functions of management are and how they operate to ensure everything in the organisation runs efficiently and effectively. Information has also been assessed and why is information important and what it is used for in organisations and how it helps organisations to achieve their objectives. ...read more. This student written piece of work is one of many that can be found in our AS and A Level ICT in Business section. This is Tesco method used to differentiate its product from its competitors who are our threat in the market, Asda, Sainsbury's, and Morrison. Tesco sells its product cheaper than its competitors that raise profit by using the above slogan. Channel choice The communication channels that the brand is to be advertised should well suit the purpose of the promotion. The Purpose and Scope of MIS - Management information systems. Intranet This is an internal system, which uses Internet technology but is available only to the company and so unauthorised users cannot enter. This usually has information such as company policies, newsletters, announcements, and details on pay, remuneration and holiday and other information that employees should be aware of. The Importance of Keeping Accurate Accounts. Community also interested whether business activity is affecting the communities environment. Competitors - will be interested in the financial information which can be freely obtained if PLC so the competitors can stay one-step ahead. Other information maybe published in the press, looking at activities of competitors to think ahead. If the business had large debts, the people who this money was owed to could not sue the directors to get their money back. So the company's assets would have to be sold to raise the money to pay off the debts. security it offer * They have limited liability Disadvantages of PLC's include: * Financial records may not be kept as private for example information regarding profits and losses and salaries and sales * Anybody can buy into the business, which may entitle him or her to decision making which means them bringing negative ideas into the business. an effect on behaviour because hormones are chemical messengers that affect our physical state. The endocrine system is regulated by the hypothalamus, which exerts its effect on the pituitary gland. Hormones released by the pituitary gland control the secretion of the other endocrine glands. The Nervous System 7 (3) Multipolar cells, which are pyramidal or stellate in shape, and characterized by their large size and by the numerous processes which issue from them. The processes are of two kinds: one of them is termed the axis-cylinder process or axon because it becomes the axis-cylinder of a nerve fiber. However, from my I might suggest the following: * Expansion overseas - e.g. Russia. * Increase market share - e.g. merge with Safeway. If Walmart took over Asda, why can't Tesco take over Safeway, for example. * Expand into new market / product - e.g.